This time our new WordPress themes collection is dedicated to jewelry and watches. Here you’ll find the themes compatible with WooCommerce providing complete shop functionality as well as the ones coming with shop page layouts suited for building your online store with ease. 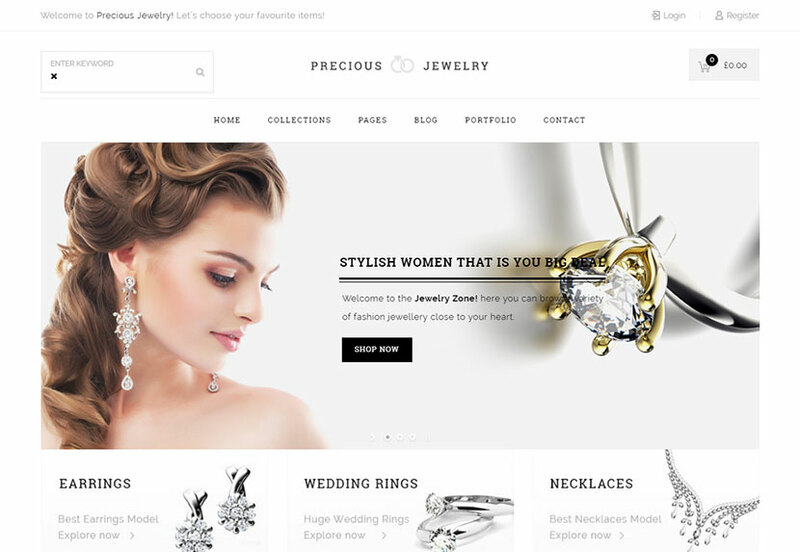 Elegant and beautiful homepage designs and a wide choice of page templates make every theme in this collection really worthy to become your debut jewelry website for promoting your jewelry business or selling your jewels right from the pages of your web-store. 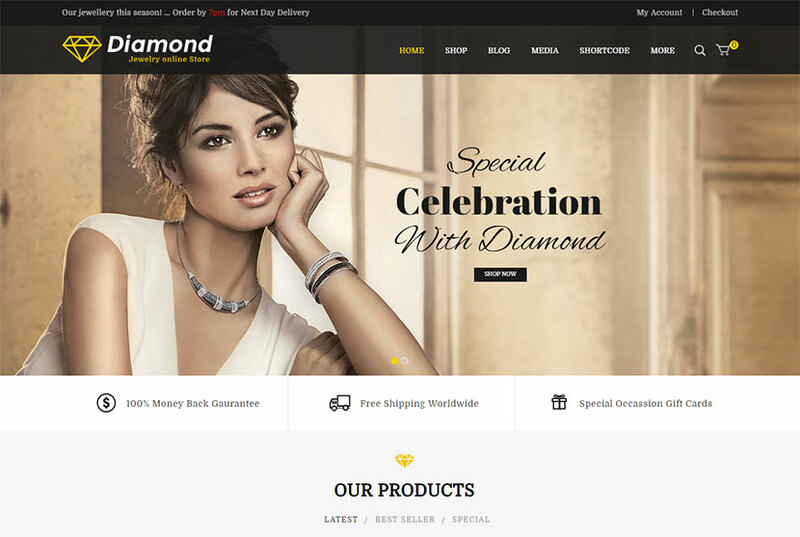 Diamond is a niche-specific WordPress theme especially designed for jewelry online stores. Thanks to its complete customizability you can use it to create either cosmetics, fashion, accessories, or any other online shop you prefer. The theme comes with a multitude of useful features helpful for creating your debut jewelry website with ease. It is integrated with Revolution Slider, supports a child theme, mega menu, parallax background image, Magnify zoom feature, product tab grid, list options, drop-down shopping cart, brand logo slider, secondary product image flipper option, team and portfolio custom types, infinite product loading options, and much more. Take a look at an exclusive WooCommerce WordPress theme which comes with a bunch of demos available for different types of goods, and jewels are no exception. Choose a suitable demo and start selling earrings, watches, or other jewelry on the Web with no hassle. The template is compatible with WC Vendors plugin for online commerce, bbPress plugin for creating forums, comes integrated with WPBakery page builder and Revolution Slider premium plugins as well. It boasts creative modern minimalist design, extensive theme settings panel, custom made widget area, and many more features included in its package. Enjoy! This is another awesome online store focused WordPress theme which includes 15 different homepages with different unique designs. Thus you will find the boxed and map, grid, full slide, parallax, lower menu, extra fullwidth, and many more variants of layouts. The template comes compatible with Dokan Multivendor Marketplace and some other popular eCommerce plugins, WPBakery drag-and-drop page builder, Revolution Slider, Contact Form 7, and some more cool solutions. It also contains custom shortcodes, clean code, Coming Soon and Maintenance feature, and many more advantages. One more WordPress template is designed as a multi-store multilingual solution which is surely going to suit any jewelry selling website. It comes with Ubermenu integrated, so you can create easy navigation menus as well as save your costs for buying this premium plugin. Of course the theme includes WPBakery page builder available for editing pages using easy drag-and-drop interface, Revolution Slider for creating awesome presentations, multiple widgets, Bootstrap based theme options, 30+ shortcodes, unlimited colors and sidebars, and many more advantages. 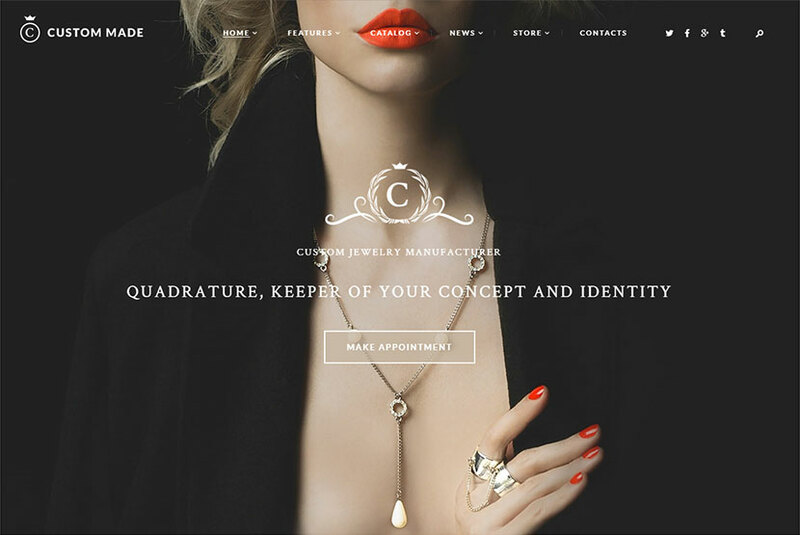 Pablo Guadi is one more stylish and creative WordPress theme fully devoted to jewelry design and handcrafted jewels store. It contains two fullwidth and one boxed homepage layouts with different beautiful jewelry oriented designs ready for customization. WPBakery drag-and-drop page builder is supported by the theme as well as PO Composer page builder that allows for easy management of the page structure. Media content manager, WPML support, WooCommerce compatibility and cart functionality, custom theme options panel, and many more features are available for the theme. 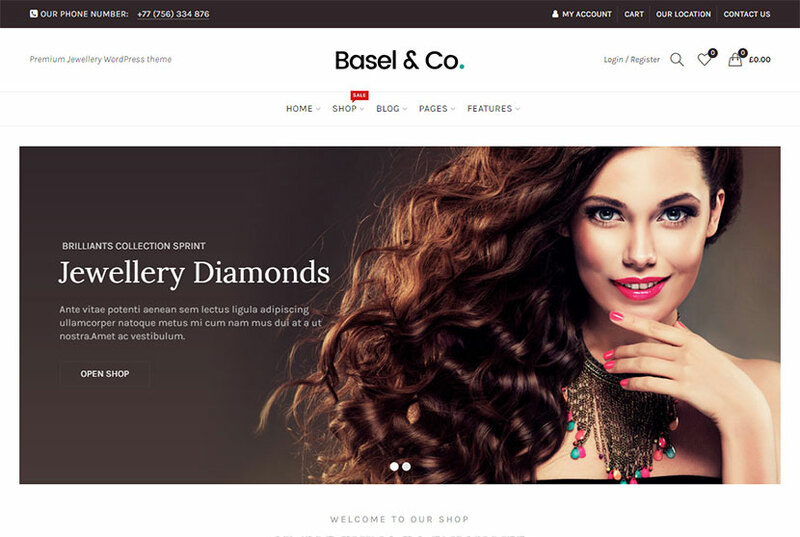 This is another great WordPress theme completely dedicated to jewelry and watches online store. 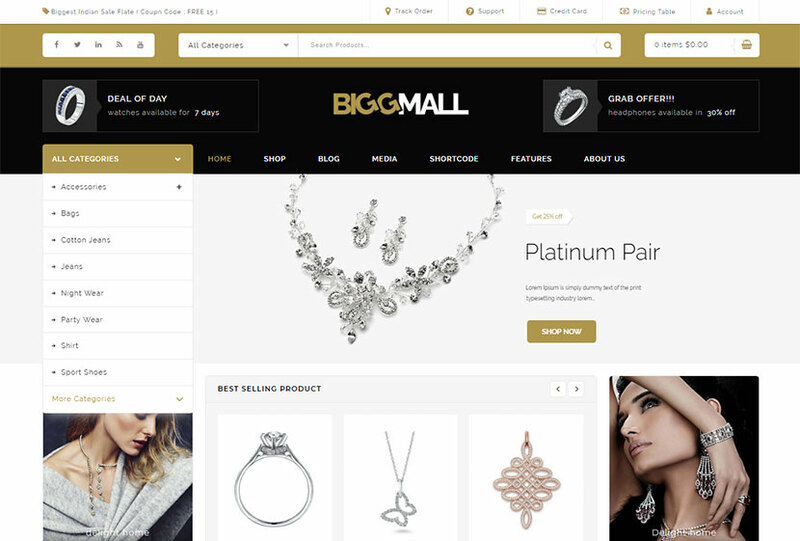 You can also take this template if you provide jewelry repair services or you run jewelry and watches shop offline and want to create its online alternative to sell chains, earrings, rings with precious stones, and other similar products on the Web. The template comes with 7 unique homepage layouts, WPBakery page builder integrated, custom shortcodes and widgets, currency switcher, language switcher, 2 modern shop page styles, outstanding galleries management, pre-defined blog and news layouts, parallax effect backgrounds, mega menu, powerful admin interface, and many more features. 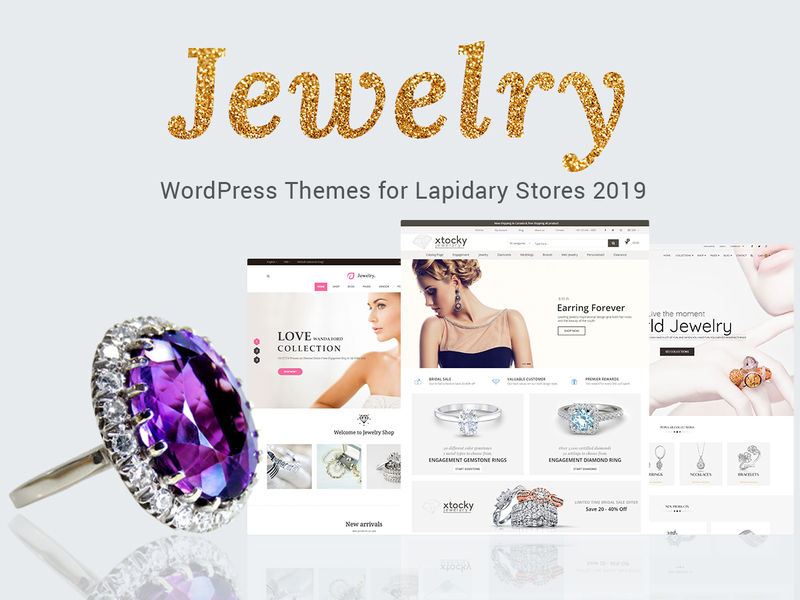 This WordPress theme is a perfect choice for jewelry manufacturer, lapidary store, watch shop, jewelry repair shop, custom jewelry services, and other related businesses. It comes with 3 homepage layouts including both fullwidth and boxed ones to select from. The template features multiple blog styles, 20+ post animations, WPBakery page builder, custom theme options, widgets and shortcodes, Slider Revolution and Swiper Slider included, user menu and main menu support, essential Grid, WPML compatibility, WooCommerce support, interactive ajax search, and many more advantages. 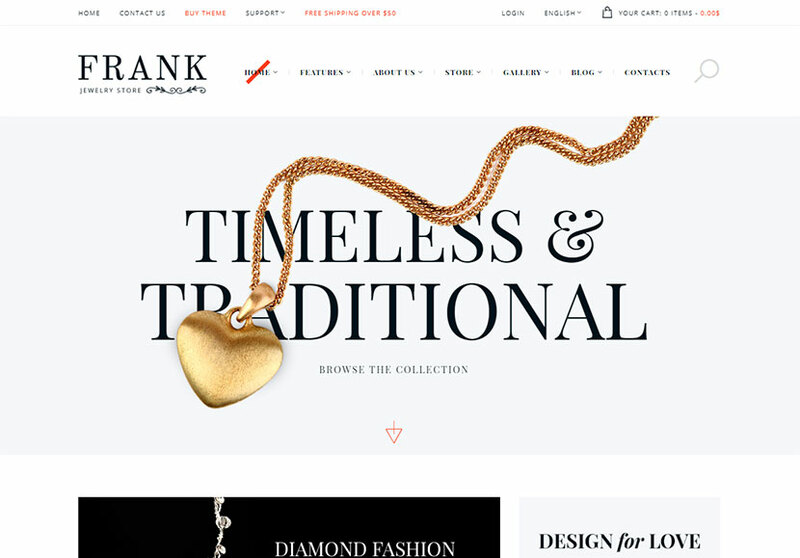 If you’re a jewelry store owner, this theme will surely have you covered. You can take this theme to start promoting your business on the Web and engage as many customers as possible. The template comes compatible with SiteOrigin page builder, mega menu, Slider Revolution support, WooCommerce integration, unlimited sidebars, 15+ inner page layouts, parallax background image, color swatch plugin, Contact Form 7 compatibility, different grid layouts for various screen sizes, and many more features. Perfomy is a multi-layout WordPress theme suited for selling either perfumes, watches or jewelry. It includes 5 unique homepage layouts suited for different types of products and available with different designs. Of course the template is compatible with WooCommerce and allows to create a top-notch online store on-the-fly. It includes shop layouts and all required shop functionality like a cart, a wishlist, checkout, currency selection, language switcher, and My Account. VC Marketplace and VC Vendors are supported by the theme as well as WPBakery page builder and many more plugins. One more cool multipurpose WooCommerce WordPress theme designed to fit the needs of many types of online stores including those that sell smart toys for kids, organic products, underwear, auto parts, furniture, sunglasses, and of course jewelry and watches. In total, the theme comes with more than 24 pre-made homepage layouts, multi-language support, custom banner slider, ajax cart and wishlist, mega menu, and much more features. It also boasts pre-designed pages with dummy products and text content, testimonials sections, contacts, product gallery, quick view functionality, and many more advantages. June is another multi-concept WooCommerce WordPress theme which comes with 15+ pre-made unique demos and more than 16 pre-built headers. You will find a tremendous bunch of page layouts designed to make your online shop creation easier than ever. The template boasts pixel perfect design; MailChimp support; wishlist, ajax login and navigation by YITH WooCommerce; Layer Slider and Revolution Slider integrated; 9 product pages; WPML compatibility; live page builder and Live Composer; ajax search and ajax filters; currency switcher; Contact Form 7; and many more features. One more cool WP theme is devoted to selling watches, clocks and other accessories on the Web. 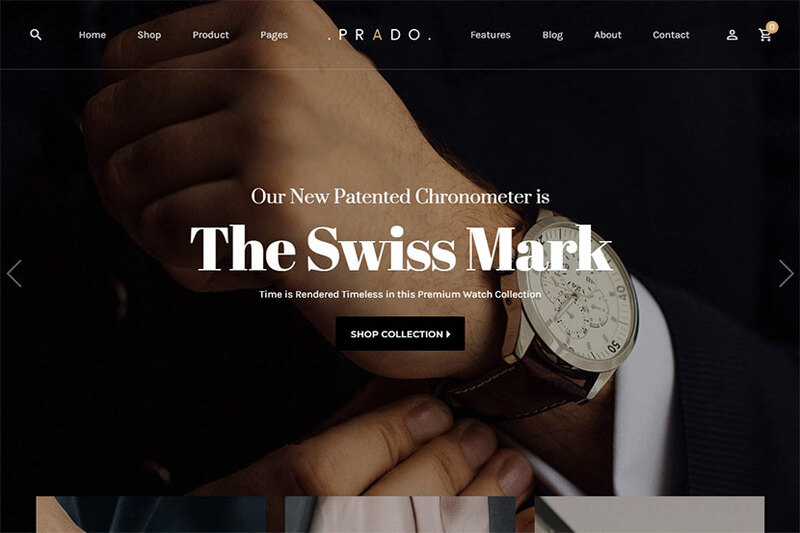 The theme comes with a great number of shop page layouts devoted to different product categories divided into sections like smart watches, tribe collection, etc. By the way, you can insert different brands of watches with a list of products in each of them as well as locate the brands in separate categories, for instance timex watch, swatch watch, transparent watch, etc. You can also easily divide products by brands and models separately to make them easy to find. The theme includes helpful page building and editing solutions such as Kirki toolkit, Unyson, and more, so you can use them for creating your online store with ease. A comprehensive multi-concept WordPress theme which comes with 200+ unique homepage templates designed for various business purposes, and jewelry is no exception. The theme also includes a number of pre-designed inner pages you can take and use for your product promotional purposes. The template includes a multitude of features including custom add-ons and shortcodes, different header types, Layer and Revolution Sliders, WooCommerce support, bbPress and BuddyPress compatibility, WPBakery drag-and-drop page builder integrated, parallax effects, pre-made widgets, extensive theme options, and much more. 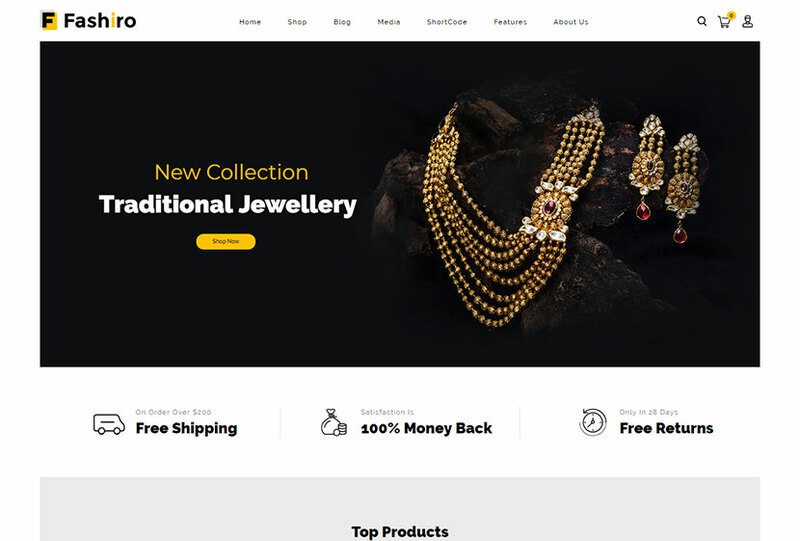 A beautiful WooCommerce WordPress theme which comes with 8+ homepage layouts devoted to different types of businesses including a jewelry selling one. It comes with clean and fresh design as well as a number of pre-designed pages you can use for constructing your website with ease. 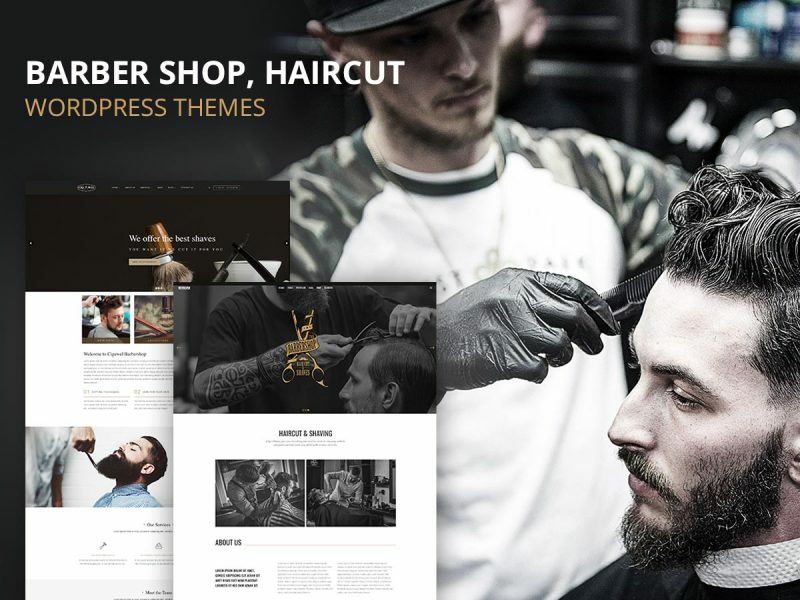 The theme also comes with a multitude of awesome features including advanced admin options panel, plenty of custom shortcodes, different gallery portfolio layouts, multi-language support, unlimited color options, shopping cart drop-down from header, unlimited banners and sliders as well as many more advantages. 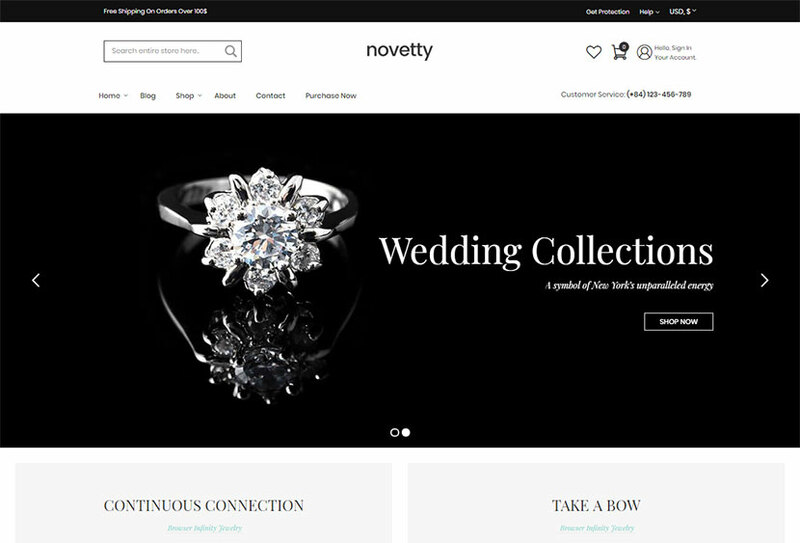 A very comprehensive WordPress theme including 20+ homepage templates pre-designed for a huge amount of purposes, and jewelry is one of them. The theme allows to create more than 50 variants of online stores for selling anything on the Web. just set up your theme, import demo and customize your site as you require. Everything comes with awesome portfolio integration, Ubermenu included, Revolution Slider supported, powerful admin panel, testimonials feature, compare and wishlist support, translation ready layout, unlimited colors, 30+ custom shortcodes, background parallax, Contact Form 7 compatibility, and many more virtues. Fashiro is one more multipurpose WordPress template which is fully compatible with WooCommerce functionality and allows to create a jewelry store on the fly. It comes with 9+ homepage variants, so each one is fully customizable and adaptable to your needs. The theme includes unlimited banners and sliders, a bunch of custom shortocdes, a cool theme options panel, portfolio and gallery layouts, shopping cart drop-down from header, multiple languages support, CSS sprite, fast loading, unlimited color options, and many more features. 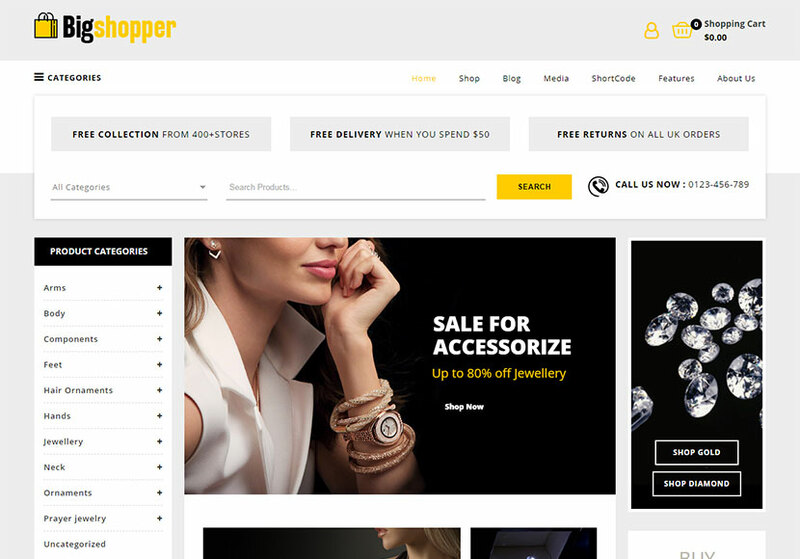 Jewelry is something that never goes out of fashion, so we are happy to introduce a fashion shop WordPress theme with full WooCommerce support. It comes with 4+ homepage layouts, so you can select any style to your taste and customize it to your preferences. The theme is integrated with WPBakery drag-and-drop page builder, so you can easily create your web-page without any coding skills required. If you need to make awesome presentation and showcase your necklaces, earrings, or other jewelry in the best possible manner, then Revolution Slider integrated with the theme also comes in handy. Check out more of the theme’s features and enjoy! 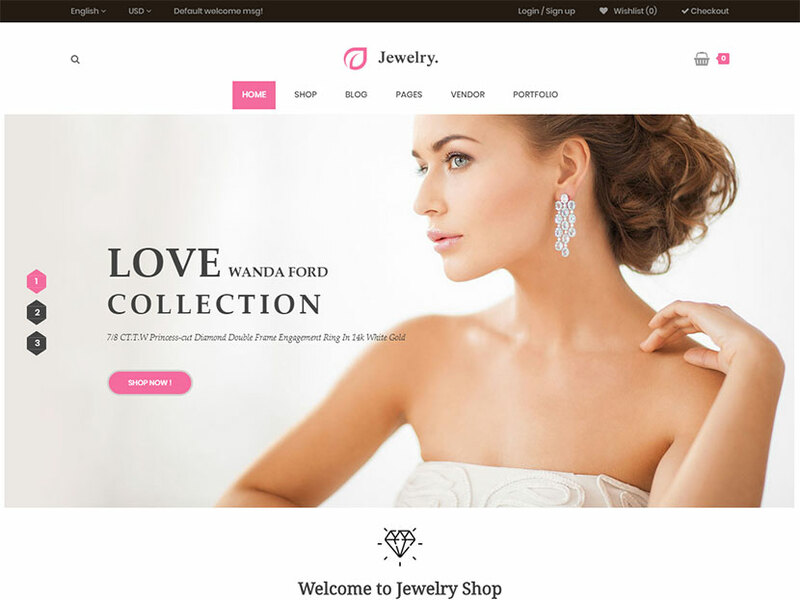 This is an extensive WordPress eCommerce theme compatible with WooCommerce plugin and available with 16+ homepage templates for varied purposes, and jewelry is one of them. You can take this theme to create a store for perfume, cosmetics, clothes, fashion store, or any other online shop on the Web. Features of Novetty include WPBakery page builder integration, Revolution Slider, mega menu, unlimited options, one-click demo importer, unlimited header styles, powerful ajax shop, limitless product page layouts, catalog mode, tailored quick view, off-canvas shopping cart, live search, and much more. Take a look at an extensive WooCommerce WordPress template which comes with 30+ homepage layouts available for different products selling, and jewelry is also included. No matter what physical or digital product you want to sell online, this theme has you covered. An extensive bunch of features is available for the theme, so you can take advantage of WPBakery drag-and-drop page builder, mega menu, RTL and WPML support, MailChimp compatibility, custom CSS, multiple theme options, boxed and fullwidth styles, 3 sidebars, 6 headers, 10+ footer layouts, a number of header backgrounds, 4 blog styles, and many more opportunities. This extensive WooCommerce WordPress theme comes with 15 homepage layouts crafted for different unique kinds of products, and jewelry-oriented design is also pre-defined. The theme boasts a multitude of features which make it a worthy choice for creating your debut online store with ease. Check out the theme’s possibilities and make sure it has multi-language and multi-currency support, Contact Form 7, WPBakery page builder and Revolution Slider integrated, multiple custom banners, pricing table, advanced search, portfolio and staff custom types, category wise product slider, and many more advantages. Wish your precious business be always prosperous! 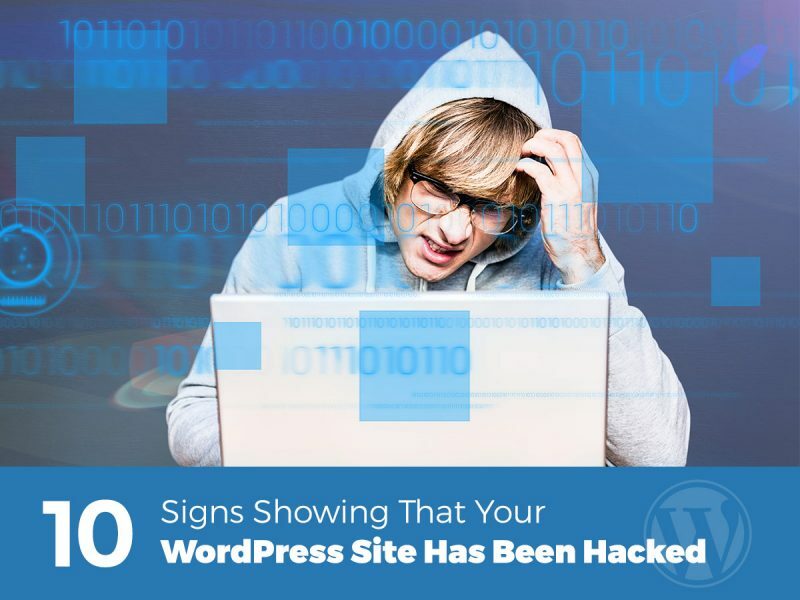 WordPress and WP Daddy are there for you.